Philadelphia Eagles news and links for 2/2/18. The Patriots will play in their third Super Bowl in four seasons when they face Jeffrey and the Eagles this Sunday at U.S. Bank Stadium in Minneapolis. In fact, Jeffery practically guaranteed an Eagles victory after he was asked if the Eagles are going to win, what has to happen? Jeffery cut the question off, and said: “Ain’t no ‘if,’ man. When we win on Sunday, ain’t no telling what we’re going to do. 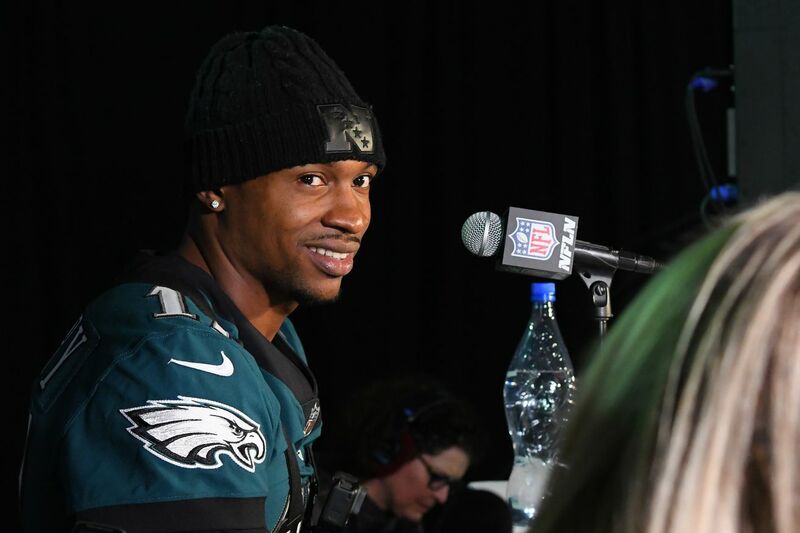 But we’re probably going to celebrate, have some fun.” The reporter followed up by asking if Jeffery is convinced that the Eagles are winning. ”We’re bringing that trophy back to Philly,” Jeffery said. The newest edition of BGN Radio is here! (Episode #299). In this episode, we preview Super Bowl LIII, talk Eagles-Patriots matchups, get you FIRED UP for the game, and much more! Out of curiosity, I asked four Eagles players who have won Super Bowls with other teams before joining the Eagles to compare the mindsets of their Super Bowl-winning teams the week of the game, and this one. Unanimously, they all agreed that this game does not seem to be too big for the players on this roster. Analyzing every team’s risk-management style, Edj determined that Philadelphia optimizes decisions — on fourth down, especially — better than its peers by a substantial margin. “The Eagles capture value at every turn,” said Tony DeFeo, the president of Edj’s sports division, “because they understand where the value lies.” That understanding saturates an organization that not only accepts counterintuitive thinking but encourages it. The approach pervades every layer, from ownership to the football operations department, and from its analytics team to a coaching staff comfortable with mining statistical analysis for advantages. Philadelphia’s defensive coordinator, Jim Schwartz, who earned an economics degree at Georgetown, has long been one of the league’s leading devotees of statistical analysis — Frigo has known him for more than a decade — and some of his players said this week that they preferred studying probabilities and tendencies even before studying situations or receivers’ routes. “We’re into the analytics as much as he is,” defensive back Jaylen Watkins said. The Eagles are going to need to score some points to beat the Patriots on Sunday. I doubt 15-10 is going to get it done this week. I have confidence in the Eagles offense. I love the coaching staff and their ability to create a gameplan and also to make in-game adjustments. This team also has some strong offensive talent. Think back to the 2004 Super Bowl offense and how that compares to this group. Every night before Chris Maragos falls asleep, he lies in his bed and thinks about running onto the football field with his teammates in Super Bowl LII. He won’t get to do that on Sunday. His season as a player ended way back on Oct. 12, when he suffered a knee injury in Carolina. But he’s continued to be a part of the team. He’s continued to be a leader and a captain. And he’s not the only one. ”Honestly, I’d like to say that it’s not pretty difficult, but I’d be lying if I said it was,” Maragos said. “Obviously, it’s disappointing not playing, but when I came to this organization I wanted to do anything I could to help this team win. Right now, my role is to help these guys from a mentorship role, from an experience role. That’s my way of contributing. The idea that the run/pass option (RPO) has redefined the Eagles’ offense with Nick Foles at quarterback isn’t really true, according to Pro Football Focus. In notes distributed by the NFL, the percentage of yards gained in the running game and the passing game hasn’t changed all that much with Foles. With Carson Wentz at quarterback, the Eagles had 31 percent of their rush attempts off RPO plays, with 33 percent of the rushing yards coming off RPO plays. With Foles at the helm, 29 percent of rush attempts have come off RPO plays, with 32 percent of rush yards off RPO plays. Where the Eagles really differ from most teams is in the play-action game. Wentz had the fifth-highest rate among 30 quarterbacks with a 26.7 percent rate using play-action, rather than a straight drop back. Foles has a percentage of 32.6 using play-action in the passing game, the highest rate among NFL quarterbacks. It’s okay if you don’t like Philly, because Philly probably doesn’t like you. That doesn’t mean we can’t be on the same side for a day, though. On Super Bowl Sunday, the majority of the country will stand united behind the Philadelphia Eagles; many of you will do so grudgingly, having chosen what you see as the lesser of two evils. Sometimes you need to form troubling alliances in defense of the greater good. And have no doubt that the Eagles, who last won a championship in 1960 (and have never won a Super Bowl), are the greater good here. They are underdogs, their roster is stocked with likable and socially conscious players, and they’re coached by an affable man who looks like Tank McNamara. I think the Patriots will attack the Eagles with a ball-out-quick, no-huddle offense designed to pick away at the few chinks in Philly’s pass-coverage armor while attempting to offset pass rush, preventing the Eagles from digging into their deep defensive line rotation, and keeping probable attack target MLB Dannell Ellerbe on the field. Defensively, the Patriots had two weeks to prepare for Philly’s RPO-heavy offense, albeit not without lingering concerns about how well they’ll handle it, particularly after Corey Grant steamed the Pats on RPOs in the conference title round. This game’s spread opened at six points in New England’s favor but has crept to four in some shops. I like the Eagles to cover the spread, but the Patriots to get the win. We often like to find ourself at the intersection of smart football statistics and film study, and times like this make us lose sleep to take on projects like this at full steam. The below deep dive will go beyond the above media cliches and examine why the NE defense yields so much against 11 personnel and what that means for Eagles Head Coach Doug Pederson. His offensive concepts link old school West Coast schemes with kind of new school Spread, and some resulting play calls specifically look to create time and space for his running backs and tight ends in the short flat and interior parts of the field. For New England, this space will be covered by their linebackers, and the best place to start is to understand their formations and players. Howie Roseman’s vindication came on a Tuesday night more than two years ago when a fast-talking, power-hungry fraud finally got kicked to the curb. The Eagles fired Chip Kelly on Dec. 29, 2015, setting in motion a remarkable re-birth for Roseman and the franchise that will culminate in Super Bowl LII. Roseman’s return from exile after losing a power struggle prompted a whirlwind of moves that rebuilt the Eagles. The general manager’s savvy, persistence and foresight turned him into the NFL Executive of the Year, but he didn’t need an award to affirm his genius. Roseman’s nearly perfect plan to re-shape Philly’s roster included a bold move that forever changed this star-crossed franchise. He triumphed when so many thought he would permanently fade into the background. He was fearless. One of the brilliant, if obvious, maneuvers the coaching staff has made since Wentz went down was to ask Foles to throw the ball quickly and not as far down the field. Foles is averaging 2 fewer air yards per pass than Wentz—a huge disparity in the modern NFL—as 40 percent of Wentz’s passes went beyond 10 yards, and only 25 percent of Foles’s do. In these playoffs, Foles has thrown his average pass in 2.42 seconds—less time than any other player in the playoffs. A full 60 percent of his passes have come in 2.5 seconds or less—better than Tom Brady by 1.1 percent. And on those throws of 2.5 seconds or less, he completes 87.2 percent of his passes—again, the best mark of any playoff quarterback. The Eagles have one of the most diverse run games in the NFL. They run inside zone, outside zone, wham, trap, pin/pull and more. It’s a tough rushing offense to prepare for, and even though the numbers might not have reflected it, the offensive line was blowing defenders off the ball in the NFC championship game against the Vikings. The Eagles have gone with a running back by committee approach all season and will continue to do so vs. the Patriots. Jay Ajayi has led the way, playing 46.2 percent of the offensive snaps in each of the first two playoff games. LeGarrette Blount will rotate in, and Corey Clement will assume his usual role on third down. The Patriots have not allowed a run of 20 yards or more in the postseason and have limited opponents to 3.5 YPC. But in the regular season, New England ranked 30th against the run. For the Eagles to truly embrace the underdog role, they should try to shorten this game with a steady diet of high-percentage throws. Do not abandon the run, and winning on third down is a must. The Patriots will want to do the opposite: sling the ball around, hurry things up, and prevent the Eagles from keeping fresh defensive personnel on the field. Our numbers say that a Philadelphia upset in this year’s Super Bowl is roughly as likely as an Atlanta upset in last year’s Super Bowl, and you may remember that we came pretty close to getting that upset. A Philadelphia upset on Sunday is more likely than a Philadelphia upset was back in Super Bowl XXXIX, and that game finished within a field goal. The Patriots are rightly favored here, since this is another New England Super Bowl, a close finish may be inevitable. Another matchup the Eagles could look to exploit is on the other side of the center, where Patriots left guard Joe Thuney has struggled mightily against bull rushes in his two years in the league. A ridiculous 60 percent (league average is 25 percent) of Thuney’s pressures allowed have come via the bull rush (26 out of 43), while Cox has picked up 24 of his pressures (40 percent) from bull rushes, so there’s a potential matchup advantage for the Eagles if they choose to take it. Obsessive hours are poured into the task. Pre-dawn mornings. Lamp-lit midnights in the office alone. Watching snap after snap of looped game film in search of that one elusive clue to unpacking the mystery. Teaching signal-callers at the pro level is work that happens in the shadows -- and it’s a job John DeFilippo always knew he wanted. The son of a coach. Football embedded in the bloodstream from the early autumn days of childhood. Watching his father, a longtime college assistant, guide a team and knowing he would someday follow suit. Certain of it. Bill Belichick takes his job very seriously. He appears to be all about football, all the time. He’s hardly ever seen smiling. He basically talks about nothing except football, unless you happen to ask about college lacrosse. His two most common sayings are “do your job” and “we’re onto [next opponent].” So one would think that one of the least likely places you would spot Bill Belichick three days before the Super Bowl would be a professional basketball game. And yet, Bill Belichick was spotted at the Bucks vs. Timberwolves game on Thursday night. We hear WBUR has their own Boston-centric playlist up today, too. We’re not even going to include a hyperlink here. You can google it if you really want evidence of Philly’s undisputable sonic dominance by comparison. I mean, come on, what amazing bands are even from Boston other than Boston? * FLY EAGLES FLY! Keep Tom Brady clean against the four-man rush. It’s simple: The Patriots offense starts and ends with Tom Brady. Naturally, protecting him will be a key for New England – and in order to do that, the Patriots a) need to incorporate their running backs as quick outlet targets, and b) block well up front against a ferocious Philadelphia pass rush that will likely try to get home with just four players. And even though the Eagles are middle-of-the-pack when it comes to sacks, they led the NFL in pressure rate according to Pro Football Focus. If Dante Scarnecchia’s unit can slow down the rush, the Patriots’ chances of winning look good. SB Nation staff writers Tyler R. Tynes and Zito Madu have huddled once again to discuss the Super Bowl. Zito, a known Patriots fan, and Tynes, a known Illadelphian, discuss which team is going to win the big game.